What the heck is Super 8? Is it an old-school camera? Is it a trashy motel chain? I watch movie trailers for a living (except for the fact I don't get paid) and I still didn't know what was going on in JJ Abrams new movie other than it looked like a love letter to E.T. and Close Encounters. Ironically enough, Spielberg is a producer on the film. I can't say he's done anything great in quite a few years. Super 8 takes place in a small industrial town in the late 70's/early 80's. (i.e. I'm not really sure) A group of friends plan to enjoy their summer break by making a gory zombie movie. One night while filming a dramatic scene by the train tracks they witness a truck driving head-on into an oncoming train. They capture the horrendous accident on film and remain silent about it and after a few days their town is overrun by secret military units and strange accidents. Everything about the movie is cloaked in mystery, from the marketing to the story itself. And that is a huge pay-off for the audience. Just go in blind and enjoy the ride. I'm not saying that there is a Shymalanesque twist that happens at the end to blow it all. Instead it's just a solid blockbuster where every scene is expertly crafted and thought out. Kudos to JJ (we are on a 2-inital friendship basis) for his direction. He is quickly becoming one of my favorite directors out there. He is no Christopher Nolan, mind you, but for Summer movies with a splash of originality he is your guy. This is the best Summer blockbuster that has been released in years. For all of you Transformer or Twilight fans who boast about box office numbers, there is a special place for you in hell. Super 8 has heart and you actually care about this cast. It helps that very few of the faces are recognizable, you actually feel that they are their character and not just Matt Damon in another role. I'm not a fan of kids in movies. No thanks. Nobody likes the too-smart-for-his-own-good kid. Nobody. 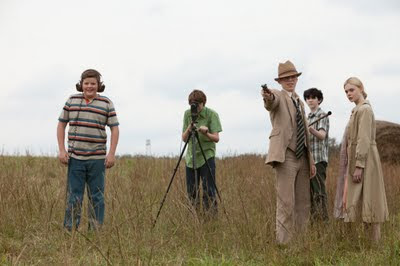 Super 8 follows the group of young filmmakers the entire time and they feel legitimate. It's been said this movie is reminescent of Goonies and it's a true statement. Both Goonies and Super 8 make you feel like you want to be a kid again. Escapism at its best. I cannot think of anything I would change about this movie. Maybe if Batman were in it, I would like it more. A very minor flaw are the lens flares that have become JJ Abrams trademark. They feel forced in every scene he uses them. This movie isn't perfect. It's not my favorite movie of all time. But it's a perfect Summer movie. Thanks! It's nice to get reviews from a number of sources and so far, I've heard nothing but good things about this flick. As for your comment about Transformers and Twilight fans...it made me laugh and laugh! Ha ha!